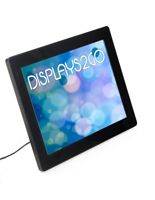 This Edge-Lit Menu Sign and 4000 Other Displays are in Stock. For Over 35 Years this Company has been Providing Quality Merchandise to Consumers. The Edge-lit Menu Sign is Sold By a Trusted Online Seller. Mounts to the wall using standoffs with chrome finish for an added touch of style. LED Lighting is energy efficient and has a long life. 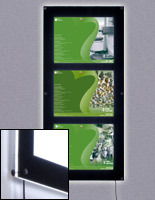 Can be mounted vertically or horizontally for different types of signage. These acrylic edge-lit menu signs that hold 8.5x11 paper are great for any business. 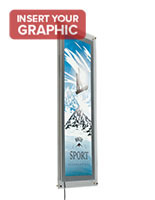 Graphics can be exchanged by easily unscrewing the stand-off bolts, then placing a new paper, ad or posting. These edge-lit menu signs, like illuminated frames, light up posters. Graphics can be made and printed on an ordinary computer, no specialty paper is needed. Durantrans printing is reccomended for top quality results. 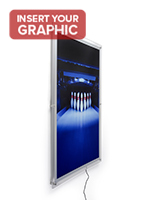 With a thin profile, these thin edge-lit menu signs are a superb alternative to other lighted frames or neon boards. This unit only protrudes out1-1/8" from the wall it is mounted to. These bright edge-lit menu signs that plug into a wall do not get hot like other illuminated frames. These acrylic LED light boxes use little energy so the product does not use as much electricity as other light boards. 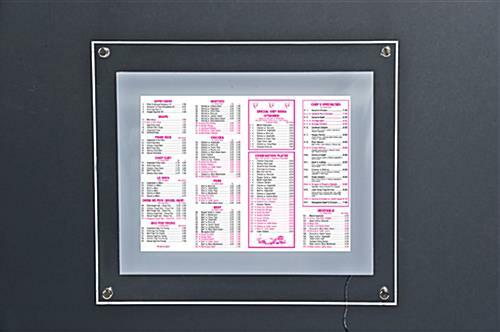 These clear bordered edge-lit menu holders can showcase and light up any posting. 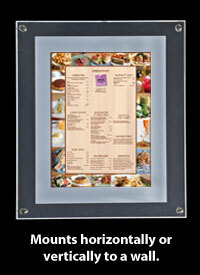 Restaurant proprietors will like these advertising frames for highlighting menus, but any company can find them of use. 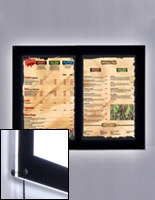 These edge-lit menu signs that attach to a wall are thinner than bulky light boxes or neon displays. These illuminated edge-lit menu signs are a great alternative to regular picture holders, as these pieces are far more attention grabbing thanks to the light up feature. 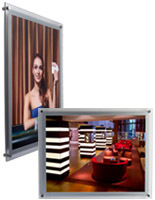 When these lighted frames are placed near an exit, many people will pay attention to them. These edge-lit menu signs are made from two acrylic boards, and can hold up to daily use. The pieces of this product consist of two plastic boards that are attached together using (4) standoffs. Paper is held in place between the two panels. Screws and wall anchors come with the unit.